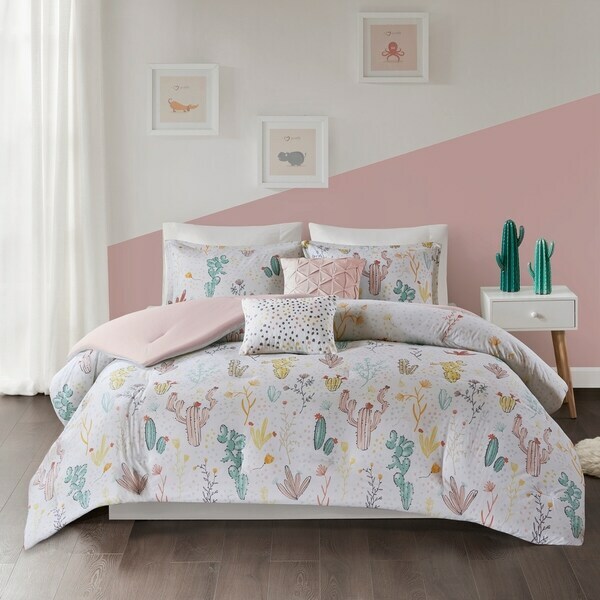 Sleep in a colorful oasis with the Urban Habitat Kids Cacti Printed Comforter Set. Made from 100-percent cotton, the comforter displays succulent and cacti motifs printed in soft, pastel colors for a charming look. A solid blush reverse adds a beautiful touch of color, while matching sham(s) with a 1-inch echoes the design of the comforter. An oblong pillow with carpet embroidery and a square pillow with tufted manipulation provide the finishing touch to complement the bedding set. Machine washable for easy care, this cotton printed comforter set will turn your bedroom into an inviting desert retreat. My daughter loved this set it’s lovely very urban whimsical. The catus with color scheme works great with the small space she has. We purchased for a twin keep in mind it’s only one pillow sham. My daughter is all into cacti so we surprised her with this bedding set for Christmas. She loves it! It is very soft. The small accent pillows are cute. It is a thinner comforter, which we like. My granddaughter and I were redoing her bedroom and she wanted to go with a cactus theme. She fell in love with this comforter set when seeing it on the website so I ordered it for her. We both absolutely love it. I surely would recommend this comforter set. I am so thrilled that my daughter absolutely loves her new bed set. As soon as she came home from school, she asked is my comforter her as yet? I responded with No not yet. So when she walked in the room she was so surprised and happy. The comforter seemed very cute for my daughter's room & it was the cheapest price I found on this specific comforter!